It was inevitable really. When the initial line-ups for the End of the Road Festival were announced, The Young Republic were conspicuous by their absence. Surely EOTR would have a place for the main band on their End of the Road Records label? They went down pretty well at last year’s festival, so it would be daft not to. Then reliably enough, once the final line-up was announced, there they were – the finest Nashville-dwelling ex-Boston band was slotted onto the main stage in the middle of Saturday. Nice. This also means that they’re coming back over for a few UK dates in September (some of these on the myspace now). But it’s a slightly different band to the one we saw and loved last year. The former 8-piece have been slimmed down to a six-some as a result of some fairly rocky times earlier in the year. 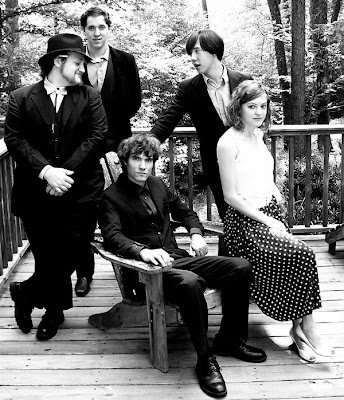 It seems that the move from Boston to Nashville last year didn’t suit everyone, and that plus no doubt other factors led to three members leaving, resulting in the five of Julian, Kristin, Bob, Nate and Chris in the photo above. Since that was taken, they’ve added one Dusty Jensen on drums to the line-up and that’ll be The Young Republic we’ll see in September. There’s more good news in the shape of a new YR record. There’s a new 6-track EP Idiot Grin, named after the lead track, out on EOTR records around the time of the festival (I think). And that’s not all. In addition to their own songs, the band have been knocking out a regular run of covers, which have been freely available at their myspace. They’ve already tackled some of the greats (and personal band faves) – Dylan’s Isis, Neil Young’s Comes a Time and Tom Waits’ Tango ‘Til They’re Sore and the latest installment is their take on Television’s See No Evil. All decent versions, despite the weight of the originals. They can hold their heads up high. Here are the tunes. You can still buy TYR’s fine UK debut 12 Tales from Winter City album from Rough Trade (on vinyl too!). The Young Republic supporting The Mountain Goats? I am so there.